Published by Magnolia Editions, Chinese Peking Opera Masks puts a lifetime of study by one of China's foremost Peking Opera scholars, Yuanchang Deng, at the reader's fingertips in a comprehensive, bilingual format. This large format book contains full color reproductions of nearly 300 unique masks from the world of Peking Opera, beautifully painted from memory by Yuanchang Deng, with notes and commentary by Mr. Deng and essays by Hung Liu and Colleen Leung. All texts are presented in both English and Chinese. Chinese Peking Opera Masks is an essential addition to the library of any enthusiast or scholar of Chinese history and culture. It is a unique and rewarding resource for experts and lay readers alike; no prior knowledge of China or its theatre tradition is required to enjoy Mr. Deng's brilliantly colored paintings and the larger-than-life tales of heroes and demons which accompany them. 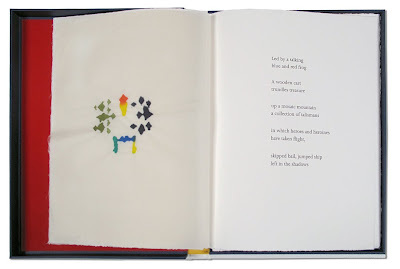 Magnolia Editions is pleased to announce the publication of A Child's Vi[r]gil, an artist's book combining hand-painted watercolors by Norbert Prangenberg with six verses by John Yau in a custom portfolio. Please click the image above for a press release with additional photos and more details about the edition. 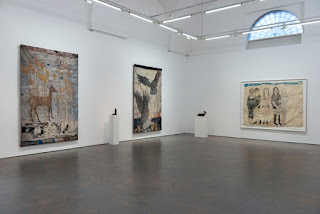 An exhibition of Prangenberg's paintings is on view at Betty Cuningham Gallery in New York until May 22; A Child's Vi[r]gil is also available at the exhibition. Drawing from Life or Death, an exhibition of new works by Hung Liu, opens Thursday April 15 at Rena Bransten Gallery in San Francisco; an opening reception will be held from 5:30-7:30 pm. The show runs April 15 - May 22, 2010. In a departure from her traditional referencing of historical photographs, this new body of work is comprised of paintings, drawings, and ceramic tiles that directly depict the dead - they are studies or contemplations of the ultimate still-life. Liu encountered her subjects, which had already crossed over to the "other side", on hikes near her Oakland home - two deer, a fawn - or, in the case of a Robin Red-Breast, the parking lot of her studio or on several visits to a local medical facility where she was invited to view human cadavers. These new subjects were studied, photographed from multiple angles, and rendered by hand; then juxtaposed with symbolic imagery - painted circles and ancient folkloric elements - in order to evoke the life cycle, the void, or the recycling of physical forms once spirits had departed. Installation: 16mm film, black-and-white, sound, 5 min. Don't miss Bruce Conner's BREAKAWAY, a video installation currently on view at the San Francisco Museum of Modern Art. 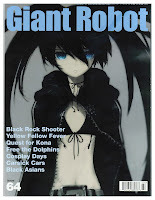 Check out issue 64 of Giant Robot magazine for a five-page interview with Hung Liu, covering everything from growing up during the Cultural Revolution in China to her blood type and favorite TV show... it's an enjoyable read and well illustrated with several of Liu's paintings.